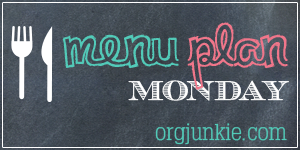 Hi Menu Planners! I hope you find this weekly post useful in planning meals for your own family each week. I am always on the search for something that will make my life just a little more simple. Juggling work, kids, the house and life in general is tough enough most days - right? So when we can find a way to get something done, just a little bit easier, we have to grab it! Where am I going with this meal planning essay this morning? I'm looking for your insight. This is a post I do for myself, as much as I do for you. Without a weekly meal plan, we will have to eat cereal and pizza every night. But since I'm here, sharing it with you - what would make it better? Would you like more links? Pictures? Recipes? Leave me a comment and let me know how I can make this weekly post more beneficial and useful to you and I will try my best!